Once we got started on the project, we realized it made sense to make many more changes than we had first envisioned. Why? First, we want to make this a really great house for modern living. Second, we started discovering some surprises (that always happens) that we wanted to change. And third, I started coming up with new ideas to enhance the design - and spend money (and yes, that always happens as well!). So, here was the starting floor plan for the First Floor. This is a surprisingly large bungalow, with 6 rooms on the first floor, as well as an enclosed porch. As previously discussed, the challenge was in the location of the staircase to the 2nd floor (click here for photos). We knew we needed to move the staircase, but with the steep pitch of the roof, it couldn't be along an exterior wall - you needed enough headroom to walk up the stairs, which required you to land in the middle. Everyone came up with ideas...we tried putting them over the basement stairs, but that just created issues on the 2nd floor. We tried moving them around in the 'staircase room', but didn't like that either. Then Dominic, our plumber, suggested eliminating the front bedroom and creating a much larger Living Room. Brilliant! We've now nicknamed it 'Dominic's Plan' and are really pleased with the layout. This layout also creates some other great features. First, it becomes a 'Foyer' type entrance - and with the Craftsman style staircase we have planned, it should have a real wow factor when you come in the front door. Second, by moving the staircase, we've also added lots of new storage. There will be a large cupboard under the staircase and a large closet in the back hallway. With the addition of that storage, we eliminated a closet that was in the back room (now called the Breakfast Room! 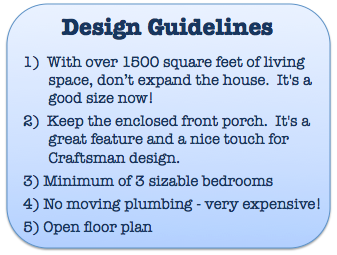 ), to create a much larger living area - as well as make space for a Craftsman style mud bench that we have planned. And third, we've moved the first floor bedroom to the back of the house, where it should be much quieter. With the rearrangement of the staircase, the 2nd floor saw lots of changes. We now have two nice sized bedrooms. The new Master Bedroom will be in the back of the house and includes a large walk in closet. The front bedroom got a little bit smaller, but is still a nice sized bedroom (15' x 12'). And we've created a brand new space that we've nicked named 'The Loft'. It's an area at the top of the stairs where we will install a big skylight on the sloped ceiling and add a built in bookcase. There's room for a desk and comfy chair - what a wonderful spot to curl up and read a book! 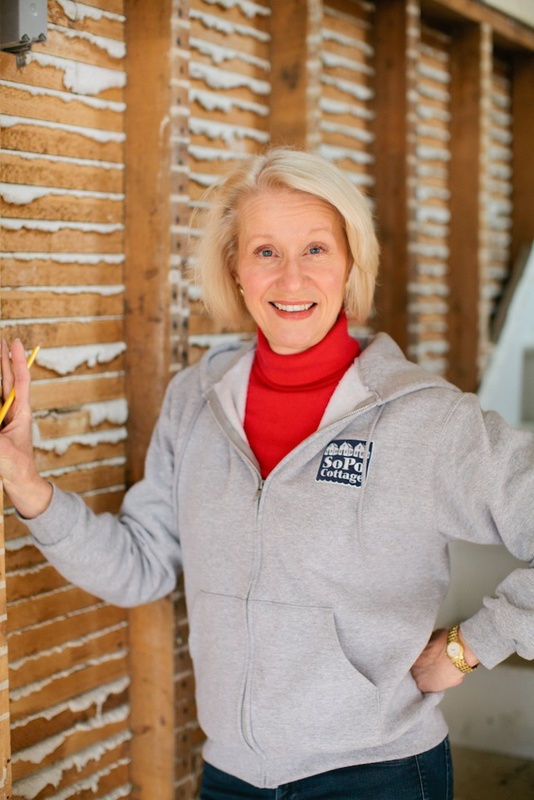 One huge learning for me as I've renovated lots of homes? Plans are really just a guideline. Once you start gutting these old houses, you tend to find surprises and need to be flexible to figure out what makes the most sense. So stay tuned, we're sure to be making a few tweaks as we go along! It's amazing what you've done... I love love love the design. 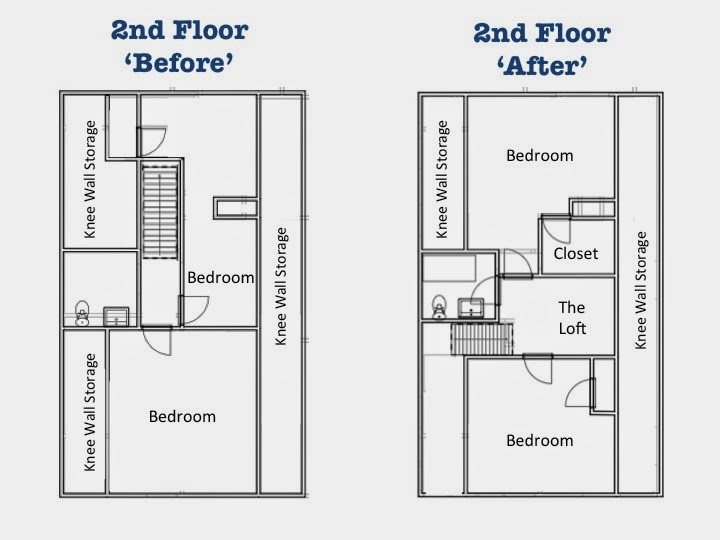 I was wondering if you ever thought of eliminating the "Loft" to use that space as closets (with bi-fold doors) for both bedrooms which would then give each room a more box-like shape as well as additional square footage? One of our challenges with the design was the furnace flue that runs through the wall between what is now the master bedroom and the walk in closet. As much as I would have loved to make that room more square, the flue couldn't be moved (we actually looked into it, but even my heating guy told me I was crazy!!). So.....we have the flue going up the closet wall with some nice shelving next to it! The new owners could certainly put bifold doors across the loft space if they wanted to. I know some folks really want a lot of storage!!! But having that bright space (thanks to the skylight) at the top of the stairs is pretty nice! Thanks for reading and commenting! I always appreciate the input! Ewww...ahhhh! I don't know about the sky light in the Loft area - that will certainly be an added bonus and a nice bright space - totally makes sense what you are doing. And those darn flues always get in the way, but sure do love those fires in the winter!!! BTW... I totally want to live your life. I think what you do sounds like the most fun thing in the world. Have you thought about having two bedrooms rather than three? With the larger groups (baby boomers and Generation X) coming up to retirement age, two bedrooms homes are becoming more popular. 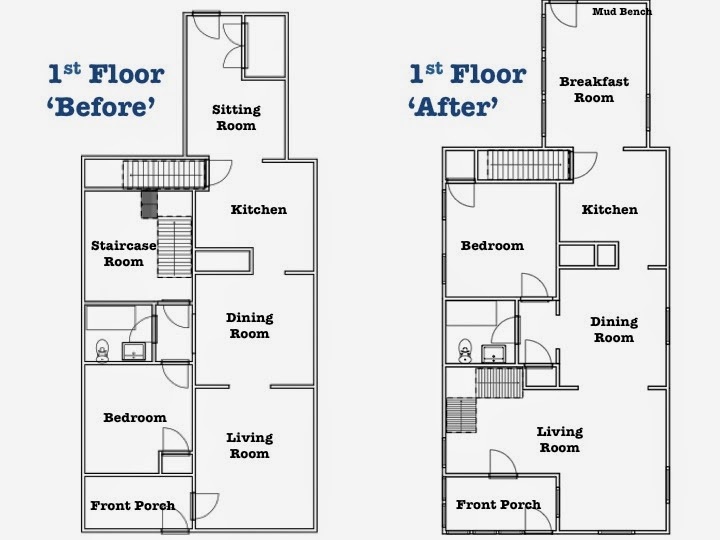 You could combine the kitchen / bedroom into a kitchen / breakfast and turn the newly planned breakfast into a study. Just wondering your thoughts. All that being said the plan is fabulous. It's so interesting you say that, because I would have thought a 2 bedroom would be a good approach as well. But what I hear from folks (particularly baby boomers) is that they really, really want a first floor bedroom. As people think about 'aging in place', they want a floor plan that will accommodate one floor living as they get older. And we have so many young couples moving into the area, they want space for the kids.....and possibly a 'Lego' room to try and keep the toys in one place! I personally like the changes you did. Awesome plan. House plans should be this good, thought well and always ready for adjustments. Now the Real Fun Starts - Demolition! !